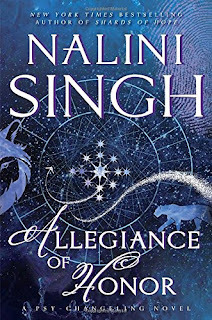 The latest installment of Nalini Singh’s Psy/Changeling series, Allegiance of Honor, explores the changes in the series world through the dual lenses of a kidnap attempt against a Psy-Changeling hybrid child and the kidnapping of a water changeling. There’s also a romance, though it’s a minor part of the story. It’s a book I think fans of the series will love but is not the best place for new readers to start. The Psy/Changeling series began with Slave to Sensation, which focused on empath Sasha Duncan and alpha leopard changeling Lucas Hunter. At the time of their story, the psy maintained a rigid emotionless protocol known as Silence. Sasha’s ability to sustain it was crumbling, and her budding relationship with Lucas allowed her to escape, even though that meant being an outcast from the psy world. The child at risk in Allegiance of Honor, Naya, is Sasha and Lucas’s daughter. 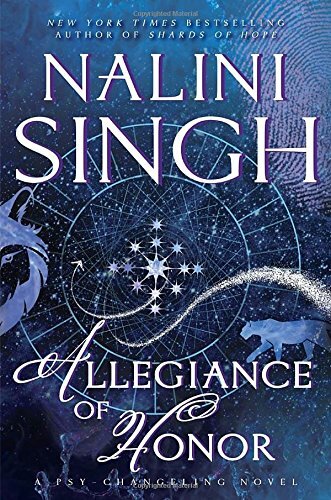 The fact that Naya is targeted gives Singh the opportunity to showcase the vast changes in the series world over the span of 15 books. Silence has crumbled, and chaos ensued, eventually leading to a new accord among psy, changelings, and humans. As always with radical social change, there are groups opposed to the new order, and some are working covertly to sabotage it. Kidnapping Naya is seen as a way to control Lucas, who has become a power in the new social structure. In contrast, whoever took the water changeling, Leila, wants to turn her into a weapon, but the purpose behind that goal isn’t revealed. The quest to free her and to unmask those behind the attempt to grab Naya showcases the teamwork among the changelings and between them and their psy allies. The bonds between these groups have deepened as the series progressed, and Allegiance of Honor brings the Human Alliance more closely into the fold. As the characters work on these two problems, the reader sees the romantic relationships and passion of couples from prior books in the series. Fans will particularly enjoy that aspect of the story. We also see more about the water changelings and the humans, and there’s new trouble in the PsyNet, the psychic web all psy need to survive. The new romance in the book comes mostly from the journal of Father Xavier Perez, who worked with Judd Lauren and Kaleb Krychek to help bring down Silence. Father Xavier’s village was wiped out by Psy. The woman he loved, Nina, escaped by jumping into the river but then vanished. He has been searching for her, and the journal entries switch to present action as his quest nears its end. This is a minor part of the story and thus is more likely to satisfy fans than new readers. The previous books in the Psy/Changeling saga are more traditionally structured as romances, and some may find those more in keeping with their reading preferences. For me, as a fan, this book rates 5 stars. She's an author I've been meaning to read - sounds good, thanks. Thank you, Catslady. I obviously love this series, and I started with Slave to Sensation. I hope you enjoy it. I read a few books at the beginning of the series, but have not keep up with it. I enjoyed them, but have not had the time. This one makes me think I need to go back and catch up.